Have you been searching for a unique gardening idea that will serve as a guaranteed conversation piece? Look no further! 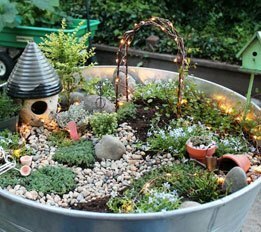 Especially beloved by children, fairy gardens are small-scale, whimsical creations that allow gardeners to express their creativity. Not only is this a fun project, it provides fairies with much-deserved hospitality as well! First, your miniature garden needs a vessel. Choose a container with a drainage hole to house your fairy garden. Plastic or terra cotta pots, as well as glass bowls and jars work nicely. Give a broken pot a new life by using it to contain your fairy garden, also incorporating the shards into your interior design. Layering specific materials will keep your garden in good condition. Pebbles on the bottom will allow water to drain. On top of them, apply a layer of charcoal so that the soil will stay fresh. A blanket of potting soil is the next step. If you have a design in mind for the layout of your garden, take a minute to sketch it out in the soil with a stick. You don’t want your plants to get too crowded; a plan can help keep your design in check. Finally, choose interesting materials for the floor of your fairy garden. Bark, pebbles and sheet moss do the trick, especially when molded and arranged to resemble grass and paths. Select a theme for your homemade scene. Consider different styles of gardens and houses—the more creative you can be, the better. Have you always wanted your own cottage or tree house? Build your own miniature version! If you have a favorite fairy tale, why not replicate its setting for your creation? Get inspiration from a pine cone from your permanent garden, a rock from your collection, or a shell found on vacation; including meaningful objects adds a personal touch. What does your dream garden look like? Bird houses, bird baths, animals, and ponds can be actualized in a fairy garden at a fraction of the regular price! Now that you have a theme, you can reinforce it through appropriate plants. As with larger gardens, you’ll want to make your selections for both aesthetic and practical reasons. Assemble a group of miniature plants with compatible watering and light requirements. For best results, make sure that your plants are also easy to prune and easy to train. As with any arrangement, keep factors such as dimension and texture in mind when planning in order to enhance the garden’s visuals. Ferns make good trees while lipstick and goldfish plant work as bushes. Use baby tears for groundcover. Climbers are perfect for fairytale scenarios; consider ivies and angel vine. Color is important for such an imaginative project, of course, so find some miniature violets, roses, kalenchoes and poinsettias to brighten up your container. A turkey baster is actually one of the best ways to water plants in a fairy garden, since it allows for so much control. Try not to fertilize too much; in this instance, you clearly don’t want your plants to become too large. To keep everything tidy, sweep soil off of garden plants and accessories with a soft brush. Household and crafting items make for inviting fairy furniture. Since fairies thrive in their natural surroundings, try to use as many organic materials as possible. A piece of bark, four sticks, and a leaf can be assembled to create a comfortable fairy bench, for instance. Think outside the box when creating furniture and a home in your little fairy habitat; the possibilities are endless. This can be an exciting aspect of this project, but also an overwhelming one. Whether or not you’re having trouble finding direction with your garden, it’s advantageous to concentrate on a key focal point in your scene. Once you decide on a good candidate, you’ll get drawn into the project; the focal point will draw the eyes of others as well. Before you know it, it’ll be time to add a dash of glitter, which makes for festive fairy dust, and wait for the new inhabitants to arrive!